One of the hottest trends in restaurants right now is "crusting" on meat. Outback Steakhouse was probably the first national chain to employ the element of a hearty layer of seasoning on steaks; there wasn't breading, but there was a distinct layer of seasoning. Others have followed suit with fish, pork and chicken dishes, adding bread crumbs to the mix. However, some home cooks realize there's a fine line between crusty and scorched. A little practice can bring about mastering this technique, but until then, there are some "cheats" on the market. Among them: Crusting Blends from McCormick. Vetter offers a video demonstration and tips for using these blends. As with mixtures you'd make yourself, crusting is as easy as brush, coat and cook. Pop them in the oven or toss them on the stove and 15 minutes later, you're set. 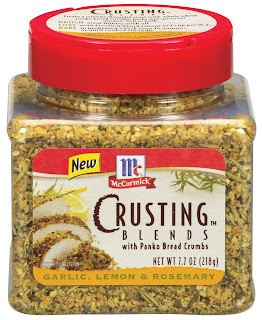 McCormick has three flavors: French onion, pepper and herb, Italian herb and cheese, garlic, lemon and rosemary. The one thing McCormick does add is panko breadcrumbs -- a coarse Japanese bread crumb that turns beautifully crisp when cooked. Panko breadcrumbs are lighter and less dense than traditional breadcrumbs; they're also not readily available by themselves locally, so in this instance, the pre-fab seasoning from McCormick may end up being a true convenience item. The suggested retail price is $3.88. The package is pretty small, though, so don't count on one bottle being enough for multiple meals. be nice to have the spice mix without the crumbs. They aren't very expensive. I've got a sample of the stuff here, and the seasoning in it is pretty intense. Frankly, to save money, I'd mix in some plain Panko to extend the seasoning and make it last a little longer.